It’s one of the oldest rites of passage mixed in with a more modern twist: a newly-minted teenage driver showing off his or her new learner’s permit or license while taking a selfie in front of an MVD office. But the Arizona Department of Transportation Motor Vehicle Division wants to remind people to keep that moment hidden from potential ID thieves. “Taking a selfie while showing your learner’s permit or driver license is a fun and popular way for new drivers to celebrate this milestone, but people do need to be careful about personal information that may be seen on those selfies,” said MVD Stakeholder Relations Manager Jennifer Bowser-Richards. 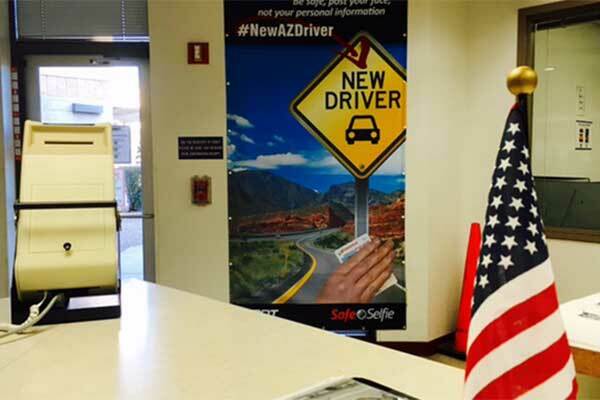 The Safe Selfie area has a large poster showing an Arizona landscape with a highway sign that reads “New Driver” with a reminder to cover any personal identifying information such as name, address and license or permit number, all of which can be exploited by ID thieves.